By now you should have a basic understanding of Twitter and a valid account. Go to Tools/Accounts and add your Twitter accounts. You can add as many accounts as you like. By default the first account you add will become your default account. You can change this later. For the default account you can select whether you like to automatically login to the twitter.com on startup. Note: In order to use Twitter Search or to watch the Public Timeline you do not need a Twitter account. You can use those features right away. The main menu can be used to show / hide the navigation pane, status bar, toolbar and to change the visual style of the application. The option dialog and the account manager is accessible via the Tools menu. The About Box and links to helpful resources can be reached via the Help menu. The toolbar can be used to show / hide the Tweet Pane and Twitter Search Pane. 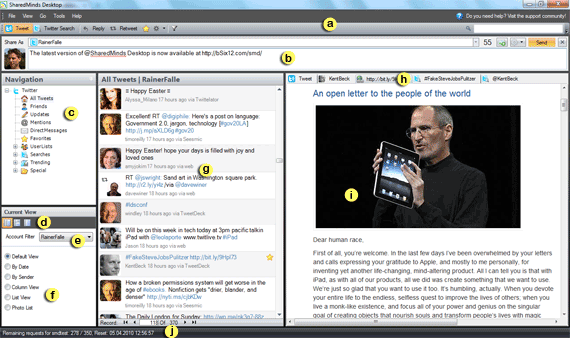 The toolbar is context sensitive and allows interacting with Tweet commands like Reply, Retweet etc. 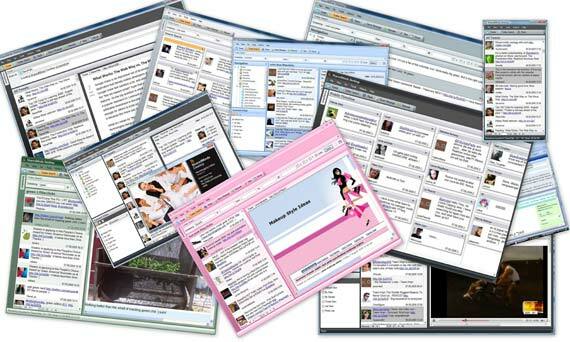 It is possible to select one account or multiple accounts for “cross account tweeting”. Spell checking support is provided (currently English only). Click on “Shorten URLs” to shorten the Tweet URLs all at once. Use the navigation pane to … well … to navigate! The navigation pane can be turned off or switched to auto hide mode via the pin button. Use this toolbar to switch between the different preview pane modes of the current view. You can select one of the following modes: Right, Bottom and Off. If you have multiple accounts configured you can select if you like to see Tweets from all accounts or from a specific account only. You can view Tweets in different ways: Default, By Date, By Sender, Tweet View, List View and Photo List. URLs, #hashtags and usernames are rendered as clickable hyperlinks. The tweet details pane can be either shown on the right, bottom or it can be turned off. For each URL, #hashtag and username a tab will be added automatically and the referenced web page, picture, video, twitter search or user profile is just one click away and can be viewed right there. Pretty cool! The status bar shows useful context sensitive information like how many request are remaining for a particular user. 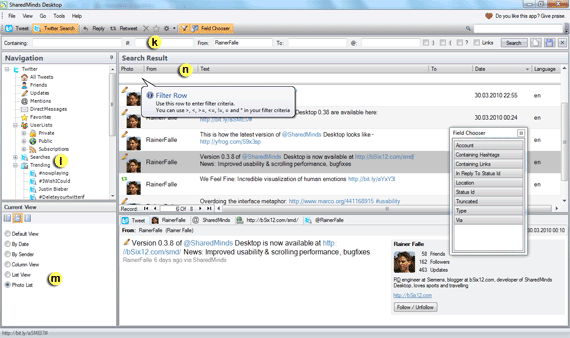 Use the easy to use search editor to construct your Twitter search queries. New search queries can be saved and existing ones can be modified. After saving your search query it will get a default name and appear as a new node under the search folder. By selecting List View or Photo List you will be able to customize the view in different ways: apply groupings, filters and choose the columns you like to display. For example it is possible to choose from a number of different columns: Name, Text, Date, Bio, Friends Count, Followers Count etc. Download the latest version at http://bSix12.com/smd. For updates you can follow @SharedMinds or @RainerFalle. Looks very good and promising. The way it present info tabs about tweets, is wonderful. Thanks for a really good twitter client. Very nice! It’s refreshing to see a Windows Twitter app that looks … well … like a real Windows app.